The large mass of the Sun makes the Earth move around it, just as the mass of the Earth makes the Moon move around it. The Earth also turns round in space, so different parts face the Sun at different times. The Earth goes around the Sun once (one "year") for every 365¼ times it turns all the way around (one "day"). The Moon goes around the Earth about every 27⅓ days, and reflects light from the Sun. As the Earth goes round the Sun at the same time, the changing light of the Moon takes about 29½ days to go from dark to bright to dark again. That is where the idea of "month" came from. However, now most months have 30 or 31 days so they fit into one year. The Earth is the only planet in our Solar System that has a large amount of liquid water. About 71% of the surface of the Earth is covered by oceans. Because of this, it is sometimes called the "Blue Planet". Because of its water, the Earth is home to millions of species of plants and animals. The things that live on Earth have changed its surface greatly. For example, early cyanobacteria changed the air and gave it oxygen. The living part of the Earth's surface is called the "biosphere". 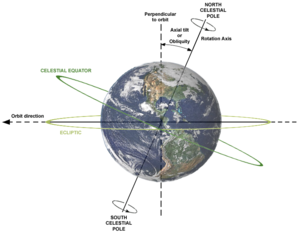 The Earth turns at an angle (an "axial tilt") in relation to its path around the Sun. The Earth is part of the eight planets and many thousands of small bodies that move around the Sun as its Solar System. The Solar System is moving through the Orion Arm of the Milky Way Galaxy now and will be for about the next 10,000 years. The Earth is generally 150,000,000 kilometers or 93,000,000 mi away from the Sun (this distance is named an "Astronomical Unit"). The Earth moves along its way at an average speed of about 30 km or 19 mi a second. The Earth turns all the way around about 365¼ times in the time it takes for the Earth to go all the way around the Sun. To make up this extra bit of a day every year, an additional day is used every four years. This is named a "leap year". The Moon goes around the Earth at an average distance of 400,000 kilometers (250,000 mi). It is locked to Earth, so that it always has the same half facing the Earth; the other half is called the "Dark Side of the Moon". It takes about 27⅓ days for the Moon to go all the way around the Earth but, because the Earth is moving around the Sun at the same time, it takes about 29½ days for the Moon to go from dark to bright to dark again. This is where the word "month" came from, even though most months now have 30 or 31 days. The Earth and the other planets formed about 4.6 billion years ago. They were made of the leftover gas from the nebula that made the Sun. The Moon may have been formed after a collision between the early Earth and a smaller planet (sometimes called Theia). Scientists believe that parts of both planets broke off — becoming (by gravity) the Moon. Earth's water came from different places. Condensing water vapour, comets and asteroids hitting the Earth made the oceans. Within a billion years (that is at about 3.6 billion years ago) the first life evolved, in the Archaean era. Some bacteria developed photosynthesis, which lets plants make food from the Sun's light and water. This released a lot of oxygen, which was first taken up by iron in solution. Eventually, free oxygen got into the atmosphere or air, making the Earth's surface suitable for aerobic life (see Great Oxygenation Event). This oxygen also formed the ozone layer which protects the Earth from bad ultraviolet radiation from the Sun. This protection made it possible for things to move from the deep ocean to the surface. The Earth was very different in the distant past. Long ago, almost all land was in one place. This is called a supercontinent. The earliest known supercontinent was called Vaalbara. Much later, there was a time (the Cryogenian) when the Earth was almost entirely covered by thick ice sheets (glaciers). This is called the Snowball Earth theory. A rough comparison of the size of Earth and the other large rocks in our Solar System: Mercury, Venus, and Mars. The Earth is rocky. It is the largest of the rocky planets moving around the Sun by mass and by size. It is still much, much smaller than the gas planets such as Jupiter, though. Over all, the Earth is made of iron (32.1%), oxygen (30.1%), silicon (15.1%), magnesium (13.9%), sulfur (2.9%), nickel (1.8%), calcium (1.5%), and aluminium (1.4%). The 1.2% left over is made of many different kinds of other chemicals. Chemicals that are very uncommon (such as gold and platinum) can be very valuable. The structure of the Earth changes from the inside to the outside. The center of the earth (the "core") is mostly iron (88.8%), nickel (5.8%), sulfur (4.5%), and less than 1% other things. The surface (the "crust") is largely oxygen (47%). Oxygen is normally a gas but it can join with other chemicals to make compounds like water and rocks. 99.22% of rocks have oxygen in them. The most common oxygen-having rocks are silica (made with silicon), alumina (made with aluminum), rust (made with iron), lime (made with calcium), magnesia (made with magnesium), potash (made with potassium), and soda (made with sodium), but there are others as well. The Earth's shape is a ball that is a little squashed on the top and bottom. This is because the Earth turns around itself very quickly, pushing the middle out a little and pulling the top and bottom in a little. The equator, the line around the middle of the Earth, is about 40,075 kilometers or 24,900 mi long and, generally, the Earth is about 12,742 kilometers or 7,918 mi wide (though, again, that changes a little when you go from the top or bottom to the middle.) When you make an overall comparison, the Earth looks very, very round but, because the Earth is so big, the highest mountain above sea level—the well-known Mount Everest (which is 8.8 km or 5.5 mi above sea level)—is not actually the one that is the farthest away from the center of the Earth. Instead, the sleeping volcano Mount Chimborazo in Ecuador is: it is only 6.3 km or 3.9 mi above sea level but it is almost at the equator. Because of this, Mount Chimborazo is 6,384.4 km or 3,967.1 mi from the center of the Earth, while Mount Everest is 2.1 kilometers or 1.3 mi closer to it. Similarly, the lowest point below sea level that we are conscious of is the Challenger Deep in the Mariana Trench in the Pacific Ocean. It is about 10.9 km or 6.8 mi below sea level, but, again, there are probably places at the bottom of the Arctic Ocean that are nearer to the center of the Earth. The deepest hole ever dug is only about 12.3 kilometers or 7.6 mi. We know a lot about the inside of the Earth, though, because we can learn things from earthquakes and the times when volcanoes erupt. We are able to see how quickly the shock waves move through the Earth in different places. The inside of the Earth is very different from the outside. Almost all of Earth's liquid water is in the seas or close to the surface. The surface also has a lot of oxygen, which comes from plants. Small and simple kinds of life can live far under the earth, but animals and plants only live on the surface or in the seas. The rocks on the surface of the Earth (the "crust") are well known. They are thicker where there is land, between 30 to 50 km or 19 to 31 mi thick. Under the seas they are sometimes only 6 km or 3.7 mi thick. There are three groups of rocks that make up most of the outside of the Earth. Some rock is made when the hot liquid rock comes from inside the earth ("igneous rocks"); another type of rock is made when sediment is laid down, usually under the sea ("sedimentary rocks"); and a third kind of rock is made when the other two are changed by very high temperature or pressure ("metamorphic rocks"). A very few rocks also fall out of the sky ("meteorites"). Below the crust is warm and almost-liquid rock that is always moving around (the "mantle"). Then, there is a thin liquid layer of very heated rock (the "outer core"). This is very hot: 7,000 °C or 13,000 °F. The middle of the inside of the Earth would be liquid as well but all the weight of the rock above it pushes it back into being solid. This solid middle part (the "inner core") is almost all iron. This is what makes the Earth magnetic. There are three ways plates can come together. Two plates can move towards each other ("convergent" plate edges). This can form islands (such as Japan), burning mountains, and high mountain ranges (such as the Andes and Himalayas). Two plates can move away from each other ("divergent" plate edges). This gives the warm liquid rock inside the earth a place to come out. This makes special mountain ranges below the sea or large low lands like Africa's Great Rift Valley. Plates are able to move beside each other as well ("transform" plate edges, such as the San Andreas Fault). This makes their edges crush against each other and makes many shocks as they move. The outside of the Earth is not even. There are high pointed places named mountains and high flat places named plateaus; there are large low places called valleys and thin low places called canyons. For the most part, moving air and water from the sky and seas damages rocks in high places and breaks them into small pieces; the air and water then move these pieces to lower places. The largest of these places are named plains and are very important for growing food and building great towns. Many persons live in the large plains of China and India, for example. Because of this, the Earth would have all been very flat a long time before now, but the moving plates discussed above make new high places before that is able to come about. All of the high and low places on Earth are made of or are on top of rocks. The different kinds of these rocks was discussed above. The outside of the Earth is usually not uncovered rock, though. Over 70% of the Earth is covered by seas full of salty water. (This salty water makes up about 97½% of all Earth's water. The fresh water persons can drink is mostly ice. Only a very small amount is at hand in rivers and under the earth for men and women to drink and use.) The air above the Earth stops the water from going away into outer space. As well, there have been so many living things for such a long time that much of the land on Earth is covered with plants or with what is left from earlier living things. Places with very little rain are dry wastes named deserts; these normally have very few living things but life is able to grow very quickly when these wastes have an uncommon rainfall. Places with large amounts of rain are almost always large woods; these sometimes have so many trees that their leaves stop all the Sun's light from being able to get to the earth at all. Lately, persons have also changed the outside of the Earth a great amount (see below). All around the Earth is a large amount of air (the "atmosphere"). The mass of the Earth pulls the gasses in the air down and does not let them go into outer space. The air is mostly made of nitrogen (about 78%) and oxygen (about 21%) but there are a few other gasses as well. Most living things need the air (or parts of the air gripped in the water) to breathe and live. They use the gasses—specially oxygen and carbon dioxide—to make and use sugar and to give themselves power. The air animals and plants use to live is only the first level of the air around the Earth (the "troposphere"). The day to day changes in this level of air are named "weather"; the changes between places far away from each other and from year to year are named the "climate". Rain and storms are both in this level. Both come about because this part of the air gets colder as it goes up. Cold air becomes thicker and falls, and warm air becomes thinner and goes up. The turning Earth moves the air as well and air moves north and south because the middle of the Earth generally gets more power from the Sun and is warmer than the north and south points. At the same time, air over water (specially very warm water) gets water in it but, because cold air is not able to take in as much water, it starts to make clouds and rain as it gets colder. The way water moves around in a circle like this is called the "water cycle". Above this first level, there are four other levels. The air gets colder as it goes up in the first level; in the second level (the "stratosphere"), the air gets warmer as it goes up. This level has a special kind of oxygen named "ozone". The ozone in this air keeps living things safe from damaging rays from the Sun. The power from these rays is what makes this level warmer and warmer. The middle level (the "mesosphere") gets colder and colder with height; the fourth level (the "thermosphere") gets warmer and warmer; and the last level (the "exosphere") is almost outer space and has very little air at all. It reaches about half the way to the Moon. The three outer levels have a lot of electric power moving through them; this is called the "ionosphere" and is important for radio and other electric waves in the air. It is also where the Northern Lights are. Even though air seems very light, the weight of all of the air above the outside of the Earth ("air pressure") is important. Generally, from sea level to the top of the outer level of the air, a space of air one square centimeter across has a mass of about 1.03 kg and a space of air one square inch across has a weight of about 14.7 pounds. The mass of the air also keeps the Earth safe when rocks ("meteorites") hit it from outer space. Without the air, the damage meteorites do would be much geater. Because of the air, meteorites generally burn up long before they get to the earth. The air also keeps the Earth warm, specially the half turned away from the Sun. Some gasses – especially methane and carbon dioxide – work like a blanket to keep things warm. In the past, the Earth has been much warmer and much colder than it is now. Since persons have grown used to the heat we have now, though, we do not want the Earth to be too much warmer or colder. Most of the ways men and women create electric power use burning kinds of carbon—specially coal, oil, and natural gas. Burning these creates new carbon dioxide and can cause more warming. A large discussion is going on now about what men and women should do about the Earth's latest warming, which has gone on for about 150 years. So far, this warming has been good for persons: plants have grown better and the weather has been better than when it was colder before. Some persons who learn about science, though, say that many bad things will possibly come about if the warming goes on. About 7 billion people live on Earth. They live in about 200 different lands called countries. Some (like Russia) are large with many large cities. Others (like the Vatican) are small. The five countries with the most people are China, India, the United States, Indonesia, and Brazil. About 90% of people live in the north half of the world, which has most of the land. Scientists think that people originally came from Africa. Now, 70% of all people do not live in Africa but in Europe and Asia. People change the Earth in many ways. They have been able to grow plants for food and clothes for about ten thousand years. When there was enough food, they were able to build towns and cities. Near these places, men and women were able to change rivers, bring water to farms, and stop floods (rising water) from coming over their land. People found useful animals and bred them so they were easier to keep. Science and industry have given men and women much better health and much more power: now even poor people can live with much more comfort and less pain than before. ↑ By International Astronomical Union convention, the term "Terra" is used for naming extensive land masses, rather than for the planet Earth. Cf. Blue, Jennifer (July 5, 2007). "Descriptor Terms (Feature Types)". Gazetteer of Planetary Nomenclature. USGS. http://planetarynames.wr.usgs.gov/jsp/append5.jsp. Retrieved 2007-07-05. ↑ 2.0 2.1 2.2 2.3 2.4 Williams, Dr. David R.. "Earth Fact Sheet". NASA. http://nssdc.gsfc.nasa.gov/planetary/factsheet/earthfact.html. Retrieved 2011-02-03. ↑ Standish, E. Myles; Williams, James C. "Orbital Ephemerides of the Sun, Moon, and Planets" (PDF). International Astronomical Union Commission 4: (Ephemerides). http://iau-comm4.jpl.nasa.gov/XSChap8.pdf. Retrieved 2010-04-03. See table 8.10.2. Calculation based upon 1 AU = 149,597,870,700(3) m.
↑ Allen, Clabon Walter; Cox, Arthur N. (2000). Allen's Astrophysical Quantities. Springer. p. 294. ISBN 0387987460 . http://books.google.com/?id=w8PK2XFLLH8C&pg=PA294. ↑ 5.0 5.1 "The age of the Earth in the twentieth century- a problem (mostly) solved". Geological Society, London, Special Publications. http://sp.lyellcollection.org/cgi/content/abstract/190/1/205. Retrieved 2009-07-28. ↑ "Rover reveals Mars was once wet enough for life". Microsoft. http://www.msnbc.msn.com/id/4202901/. Retrieved 28 July 2009. ↑ "How many species are there on Earth". Harvard University. http://adsabs.harvard.edu/abs/1988Sci...241.1441M. Retrieved 2009-07-28. ↑ Purves, William Kirkwood et al (2001). Life, the science of biology. Macmillan. p. 455. ISBN 0716738732 . ↑ "Origins of life on Earth". Space.com. http://www.space.com/searchforlife/life_origins_001205.html. Retrieved 2009-07-28. ↑ "Earth's location in the Milky Way". NASA. http://imagine.gsfc.nasa.gov/docs/ask_astro/answers/030827a.html. Retrieved 2009-08-06. ↑ "NASA- an Earth fact sheet". NASA. http://nssdc.gsfc.nasa.gov/planetary/factsheet/earthfact.html. Retrieved 2009-08-06. ↑ Dalrymple, G. Brent (2001). "The age of the Earth in the twentieth century: a problem (mostly) solved". Special Publications, Geological Society of London 190 (1): 205–221. doi:10.1144/GSL.SP.2001.190.01.14 . ↑ "Origin of the Moon in a giant impact near the end of the Earth's formation". Nature.com. http://www.nature.com/nature/journal/v412/n6848/abs/412708a0.html. Retrieved 2009-07-28. ↑ "Earth life appeared on land 1.5 billion years earlier than previously thought". SpaceRef.com. http://www.spaceref.com/news/viewnews.html?id=258. Retrieved 2009-07-03. ↑ 17.0 17.1 "The Snowball Earth". Paul F. Hoffman and Daniel P. Schrag. Harvard University. August 8, 1999. https://web.archive.org/web/20090910075356/http://www.eps.harvard.edu/people/faculty/hoffman/snowball_paper.html. Retrieved 2009-07-28. ↑ Chisholm, Hugh (editor). "Petrology" in the Encyclopædia Britannica, 11th edition. Cambridge University Press (Cambridge), 1911. ↑ Sharp, David (2005-03-05). "Chimborazo and the old kilogram". The Lancet 365 (9462): 831–832. doi:10.1016/S0140-6736(05)71021-7 . ↑ "Tall tales about highest peaks". Australian Broadcasting Corporation. http://www.abc.net.au/science/k2/moments/s1086384.htm. Retrieved 2008-12-29. ↑ "7,000 m Class Remotely Operated Vehicle KAIKO 7000". Japan Agency for Marine-Earth Science and Technology (JAMSTEC). http://www.jamstec.go.jp/e/about/equipment/ships/kaiko7000.html. Retrieved 2008-06-07. ↑ Toshiro Tanimoto. "Crustal Surface of the Earth". American Geophysical Union. http://www.agu.org/reference/gephys/15_tanimoto.pdf. Retrieved 2009-08-02. ↑ D. Alfé; M. J. Gillan, L. Vočadlo, J. Brodholt, G. D. Price (2002-04-25). "The ab initio simulation of the Earth’s core". D. Alfé. http://chianti.geol.ucl.ac.uk/~dario/pubblicazioni/PTRSA2002.pdf. Retrieved 2009-08-02. ↑ "The Crust". Oregon State University. http://volcano.oregonstate.edu/education/vwlessons/lessons/Earths_layers/Earths_layers4.html. Retrieved 2009-07-03. ↑ "Understanding plate motions". USGS. http://pubs.usgs.gov/gip/dynamic/understanding.html. Retrieved 12 June 2010. ↑ Oreskes (2003). Plate tectonics: an insider's history of the modern theory of the Earth. Westview Press. ISBN 9780813341329 . ↑ "CHAPTER 8: Introduction to the Hydrosphere". Physical Geography. http://www.physicalgeography.net/fundamentals/8a.html. Retrieved 2009-08-06. ↑ "NASA - Earth's atmosphere". NASA. http://www.nasa.gov/audience/forstudents/9-12/features/912_liftoff_atm.html. Retrieved 2009-08-06. ↑ 35.0 35.1 "What causes weather?". NASA. http://www.nasa.gov/worldbook/weather_worldbook.html. Retrieved 2009-08-06. ↑ "Fundamentals of physical geography - the greenhouse effect". Physical Geography. http://www.physicalgeography.net/fundamentals/7h.html. Retrieved 2009-08-06. "Solar Views". Calvin J. Hamilton. http://www.solarviews.com/eng/earth.htm. Retrieved 06-08-2009. "NASA – Earth". Nasa. http://www.earth.nasa.gov/science/questions.html. Retrieved 06-08-2009. This page was last changed on 17 December 2014, at 15:06.